Honda Civic is now in its 10th generation and has been up for sale in the North American Market since November 2015. I checked out the sedan version of the new Civic and shared a detailed review few months ago. There is no second thought about the fact that the new Civic is a major improvement over its predecessor. 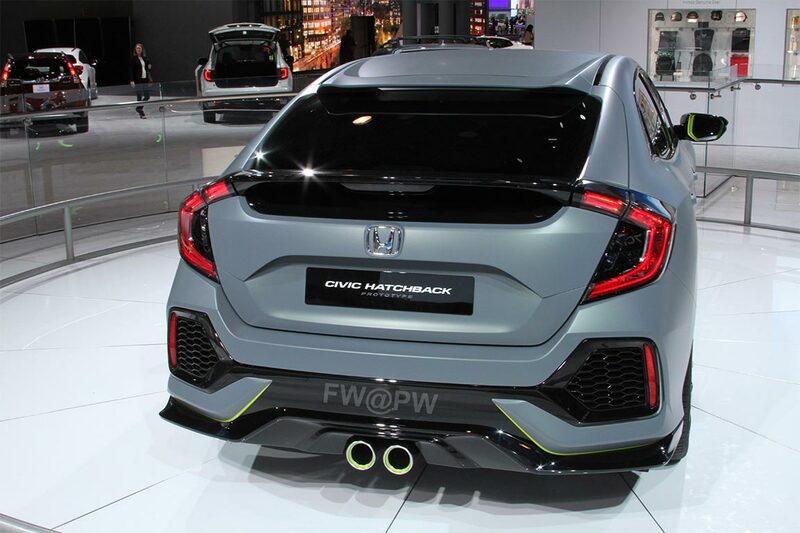 One can say that Civic has posted a new benchmark in the compact car segment. From exterior to interior, performance, technology, features and driving pleasure, the 10th generation is highly improved. The new Civic won many awards in the North American market including the most respected “North American Car Of The Year Award”. Geographically, Honda Civic is available as a sedan in the US market as well as a Coupe while it is available only as a sedan in Asian markets. For sometime though, Civic was introduced as a hatchback in North America but due to low sales, it was discontinued. In Europe however; hatchbacks are more common, so Civic continued to be available as a hatchback, but the sedan was not on offer. For the 10th generation, Civic will be introduced as sedan along with the hatchback in Europe and will arrive by early 2017. Civic is also available as a Tourer (station wagon/estate ) in Europe. 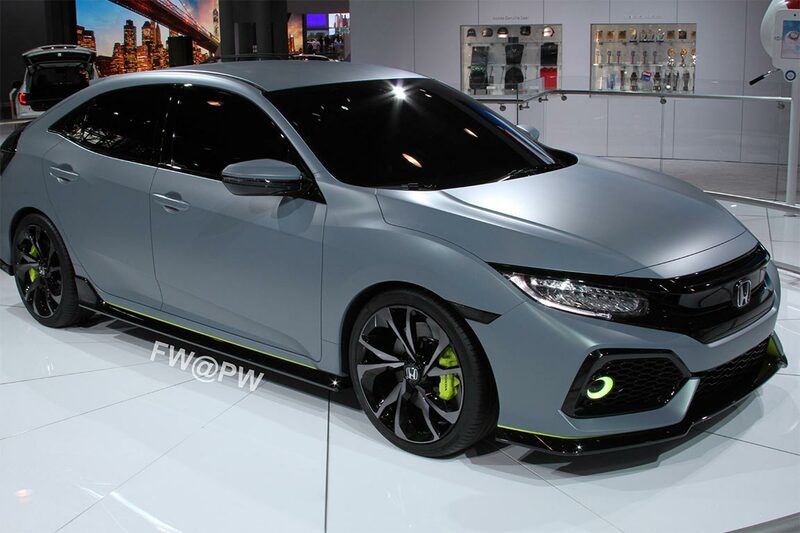 It is, however, too early to predict if Honda will replace the estate variant with a newer generation. North American car market has changed over the last decade; hatchbacks and small cars are now popular. Every car brand has their version of hatchbacks for customers. 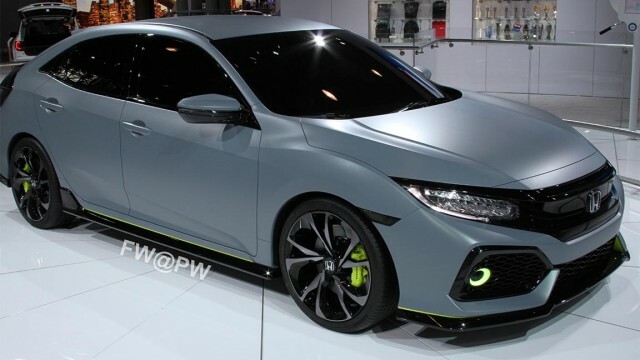 After the release of 10th generation Civic sedan, Honda confirmed that it will bring the new Civic in various flavors. 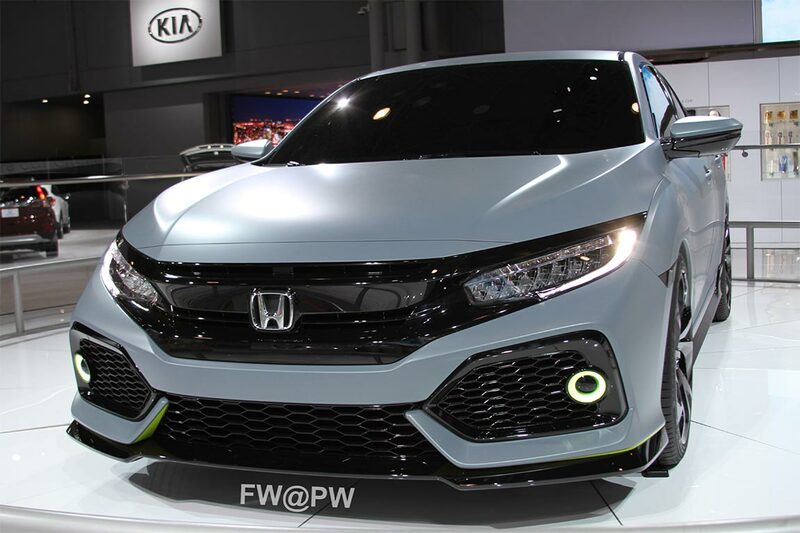 A Civic Coupe was revealed few months ago at LA auto show and more recently, Civic Hatchback concept was revealed at the Geneva Auto show. Today I had an opportunity to visit the New York Auto Show in New York City. The first thing I did was to walk to the Honda stage as many of our readers are more interested to know about the Civic than any other car. 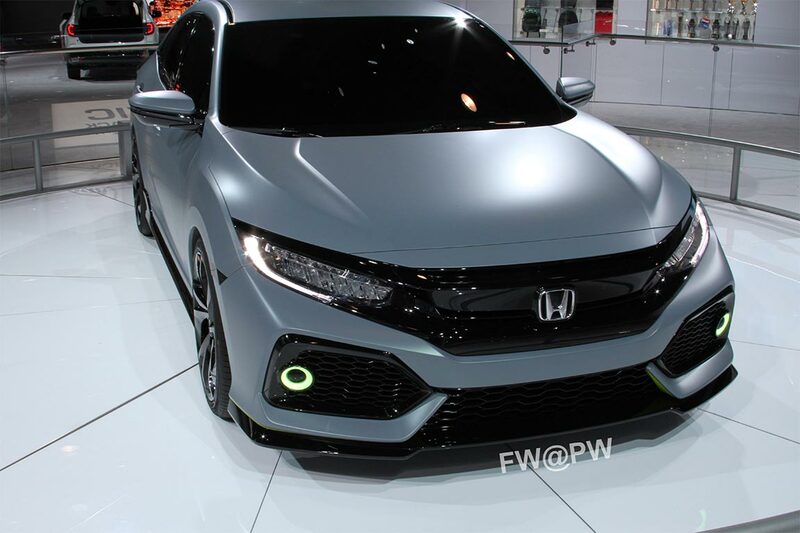 The concept Civic hatchback in a grayish matte paint with 100 percent black tinted glass was on rotational display and was quite honestly, looked fantastic under show lights. 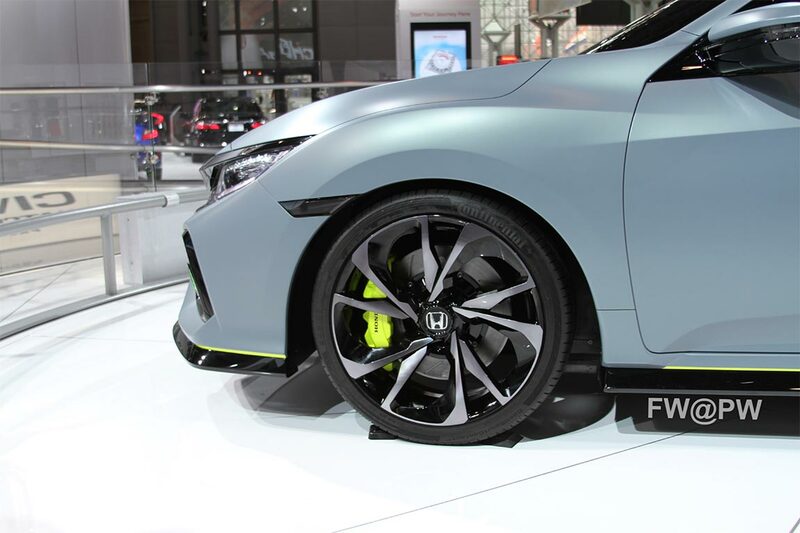 The lime green brakes calipers were making the car stand out. The concept 5-door hatchback looks similar to its sedan counterpart. It sort of looks the same, only smaller than the sedan and that’s what makes it such a good looking hatchback. The concept gets same LED headlights with LED DRL’s as we have seen on the production sedan. The concept shows larger vents with round halo styled fog lamps on the front bumper. The 10th generation sedan and concept looks almost identical till B pillar. From B pillar onward, the hatchback has different lines with increased sloping roof at the C pillar which then converge into the rear hatch that has a full-size rear glass. At the rear the hatchback receives identical C shaped tail lights as on sedan. The concept have large size diffusers in the rear bumper. 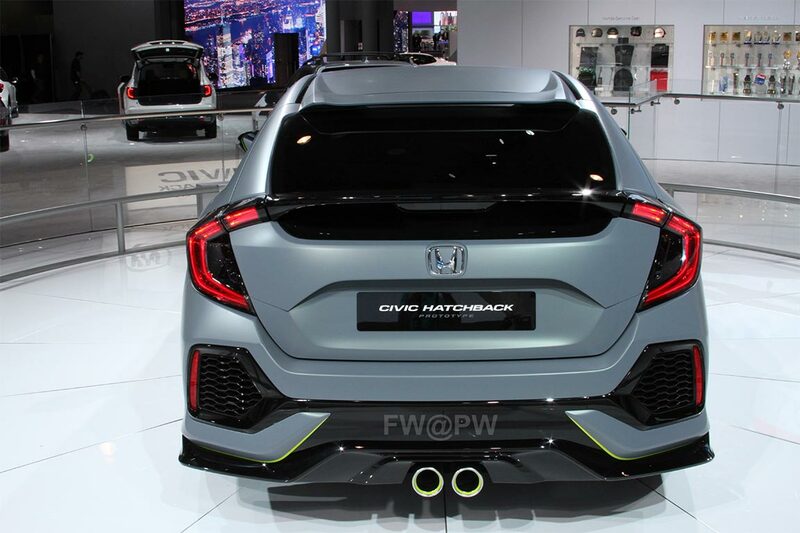 There is a dual exhaust tips at the middle of the rear bumper which gives the concept very sporty and aggressive styling. 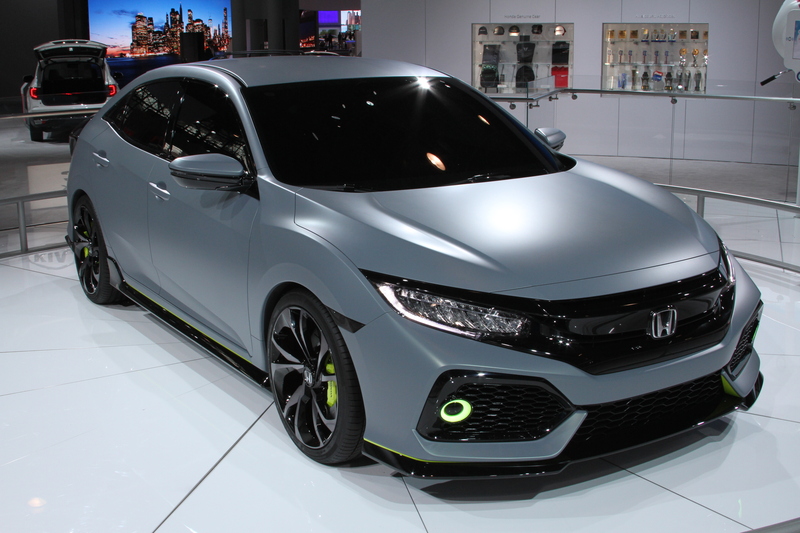 I asked a Honda rep at the show and came to know that most of the car exterior as seen on the concept will remain as it is on the production model. There will be some exterior items that will not make it to production such as fog lamps, the rear bumper design and the exhaust tips. The same didn’t make it to the production model of the Civic sedan as it was shown on Civic Concept a year ago. 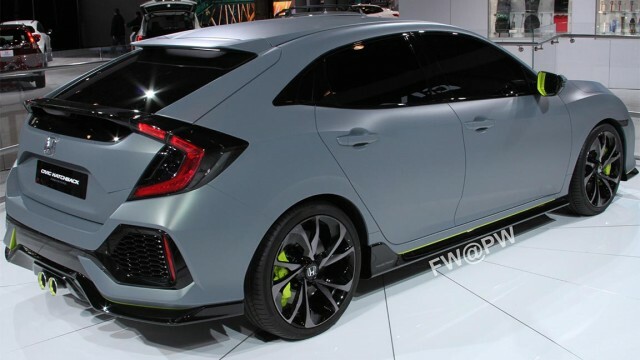 Coming to the interior, that I could not see due to the jet black window tints, however Honda will keep the same interior as found on the Civic sedan. 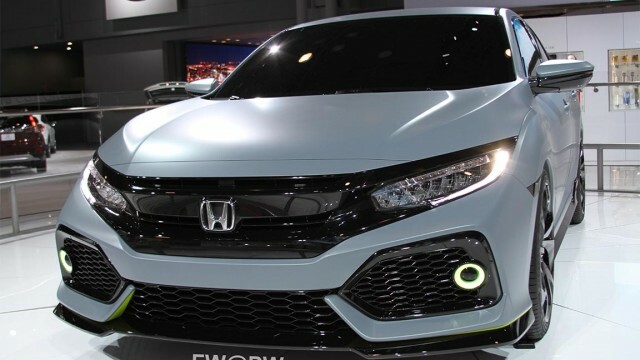 No details about the engine but it is expected to come with a 2-liter NA (Civic Type R perhaps) and the 1.5-liter turbo engine in the US market while a 1-liter turbo and the 1.5-liter Turbo is planned for the European market. 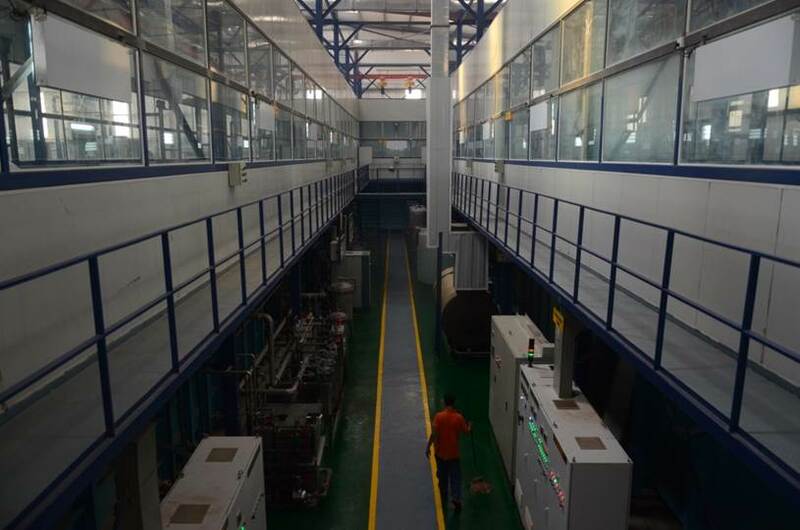 Honda is also planning the famous 1.6-liter i-DTEC diesel engine, but it will not make it to United States and Pakistan as well. The transmission, like Civic sedan, the hatchback will also be available with a manual and a CVT depending on variant. 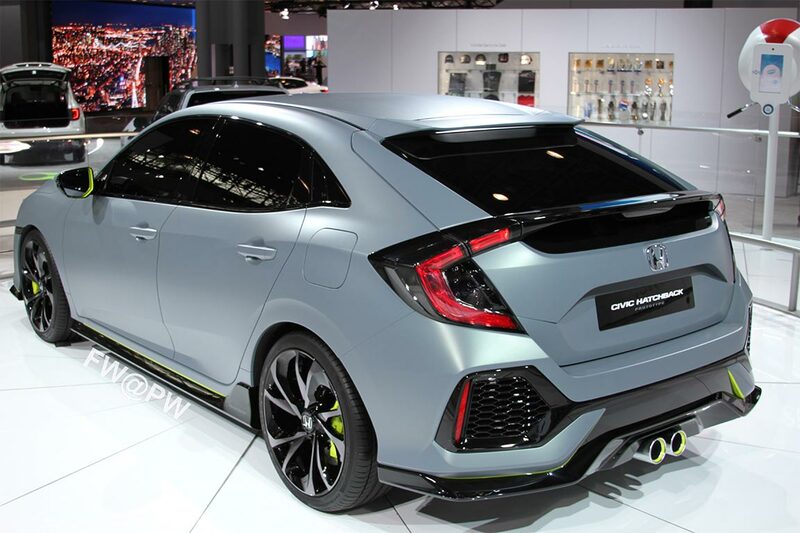 The 2-liter turbocharged Civic Type R hatchback is also on schedule but will not arrive earlier than 2018. 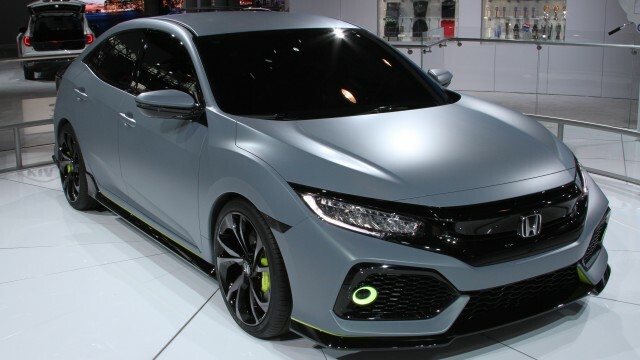 The hatchback will be manufactured exclusively at the Honda manufacturing plant in Swindon, United Kingdom and will be exported to the United States and other markets from there. 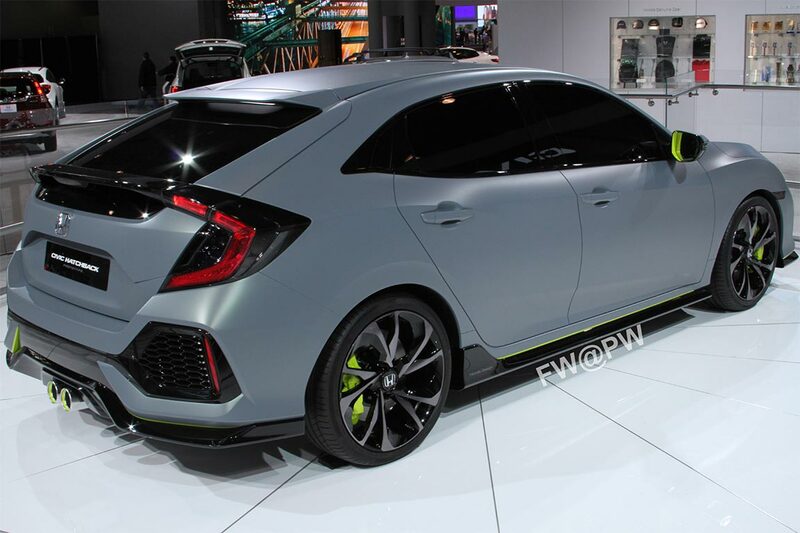 The Civic hatchback will be up for sale in the United States by the end of 2016. 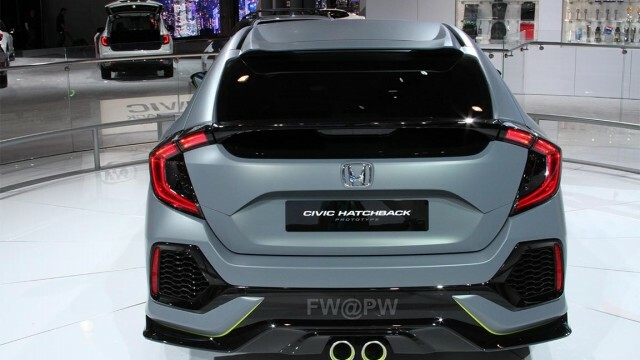 Here’s hoping Pakistan also gets the Civic hatchback as personally, it looks far better than the sedan. paisa bahut hai hamaray mulk me, koi na koi import karwa hi lega! 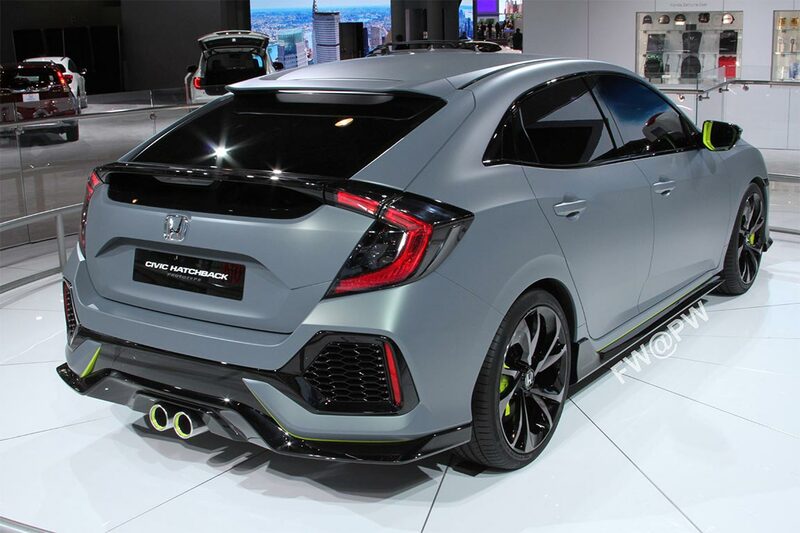 If imported, this will be for the rich but if it isn’t, and Honda Atlas decides to bring this in the line up. The Civic hatchback basically competes with the likes of Suzuki Swift, etc. So assembling it here would bring it in everyone’s reach. It won’t be same without the rear bumper and the exhaust tip. They should really produce the same concept car.